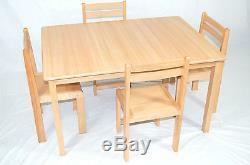 Wooden Table With 4 Chairs. Suitable For Study & Different Activities. Easy Clean Surface Chair Height (Floor To Top) 48 Cm Height (Floor To Seat) 31 Cm Width 32 Cm Depth 29 Cm Table Height 53 Cm Width 55 Cm Length 110 Cm Table need Self assembly. Unit 19 Horizon Business Centre, Alder Close, Veridou Park, Erith, DA18 4AJ (15 Min Drive From London Black Wall Tunnel) We Have Different Colours. Of Kids Chairs And Tables. You Can Visit Us And Select From The Available Colours. The item "Kids Wooden Table and Chairs/classroom chairs/classroom tables/School Furniture" is in sale since Monday, April 02, 2012. This item is in the category "Home, Furniture & DIY\Children's Home & Furniture\Furniture\Tables & Chairs". The seller is "importersexportersltd" and is located in London, London.